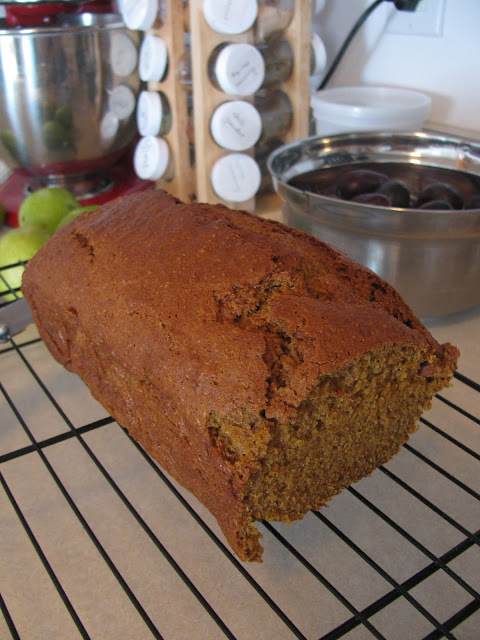 I discovered pumpkin chocolate-chip bread my first semester in college and immediately fell head-over-heels in love! I have used a recipe given to me by the neighbor who first introduced me to the stuff ever since, but I think that this recipe will be my new go-to recipe. It's moist, delicious, and is just as good the second day! I actually already dialed down the sugar from the original recipe, and I think I could subtract a bit more and it would still be delicious. This recipe makes two tall medium loaves of bread (probably two flatter large loaves), or 24 muffins. Preheat oven to 350. I like to line my loaf pans with foil or parchment paper because they tend to slightly carmelize the outside crust of quickbreads like this, and I don't like that... but that's completely optional. Grease pan (or muffin tin). In large bowl, mix together water, eggs, oil, and pumpkin until smooth. Gently add dry ingredients on top of the wet ones (I do flour first, then sugar, then baking soda and spices) and sift together with a fork, then combine with wet ingredients. (This is my easy one-bowl solution to the wet mix/dry mix problem!) Fold in chocolate chips and pour batter into prepared receptacles. Bake for 20-30 minutes (regular-sized muffins) or 60-70 minutes (loaves), until toothpick inserted in center comes out clean. This bread is delicious warm, and equally delicious after it cools! It also freezes REALLY well - just let it cool completely and then wrap it first in plastic wrap and then in tinfoil. When you're ready to eat it, let it thaw for a few hours at room temperature. This recipe is a definite all-around winner! This recipe is similar to the Rosemary Grilled Chicken with Lemon-Cream Pasta, but—dare I say—it is both simpler and better. Cream, lemon juice, olive oil, and pasta water combine to create an unbelievably light and delicious meal that takes 15 minutes or less to put together! It's a great alternative to picking up pizza on those nights when you just can't spend a lot of time on dinner. And in all honesty, I could probably eat this every day for a week (maybe more!) and still be in heaven. Divine, I tell you. Divine. I usually do 1/2 or 3/4 of this recipe and it makes two meals for us. (The leftovers are great drizzled with a little extra olive oil before they're reheated!) Also, it's definitely a flexible, "go by taste" recipe, as I've indicated by my somewhat imprecise measurements! Bring salted water to a boil on stove; cook pasta until noodles reach desired tenderness. 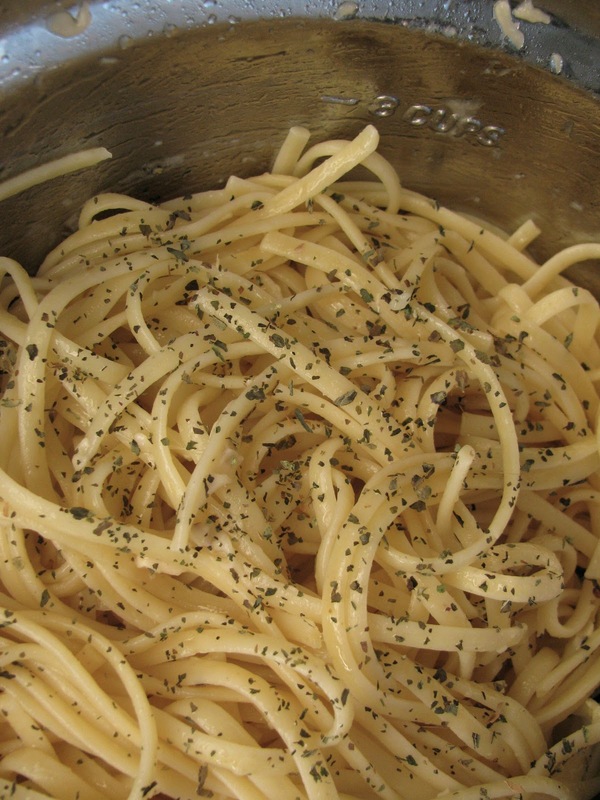 When noodles are finished cooking, reserve about 1 1/2 cups of the pasta water and drain the rest. Leave the noodles in the strainer in a minute and combine lemon juice, olive oil, cream, pepper, and one cup of the pasta water in the pot. Boil for 2 minutes over medium-high heat, stirring a few times to get everything combined. In large bowl, toss together pasta, sauce, and parmesan (reserving a little bit to put on top). Taste a noodle to see if you want any more lemon juice; you can also add more pasta water if you want the dish looser. Garnish with basil and remaining parmesan.